Runcation (noun) – an obsolete word meaning the act of weeding by hand. On the 1st of June, runcation appeared in my email inbox, as the Oxford English Dictionary’s word of the day. It’s from the Latin verb rucare and is not a RUNcation, a vacation for those addicted to jogging or training for marathons – something I came across when doing an internet search on the word. 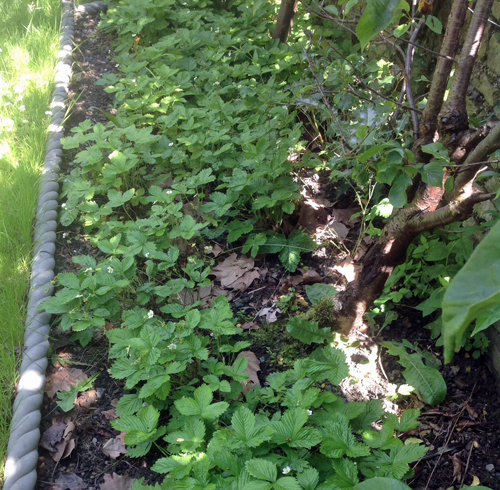 I thought it a prophetic noun to start the month in the garden – particularly as I finally got around to weeding the fruit tree border with its underplanting of alpine strawberries (and dandelions, grasses, plantains, buttercups, chickweed…holly and sycamore seedlings…etc.). The slugs have also been active as you can see in the large holes made in the rhubarb leaves. One morning I spotted a snail at eye level inching its way up the tall fennel stalks. 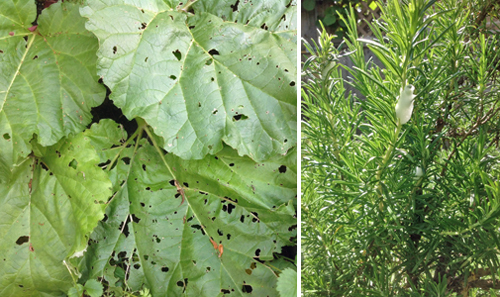 The rosemary is a prime spot for an insect that lives in what is colloquially known as cuckoo spit – seen in the image below to the right. And, of course, spiders both large and small abound – some of which are beneficial and others that tend to spread diseases. Okay, all the negatives out of the way, I can concentrate on the positives. The first and foremost positive being the berries and other fruit forming. 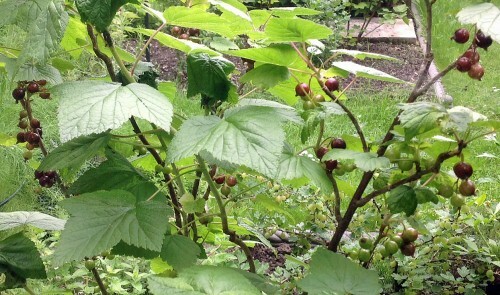 It looks like the black currants, incongruently placed in the herb bed, might be the first fruit to be harvested. That is, other than the rhubarb – a curiosity classed as both fruit and vegetable. I don’t usually get many black currants, but they make a fantastic jelly and are a perfect addition to my lemon barley water. And, I’ve found a rather swish solution to guarding the strawberries: stylish wire cloches rimmed with copper. Remember those cuttings I took from the lavender and some of the other herbs? 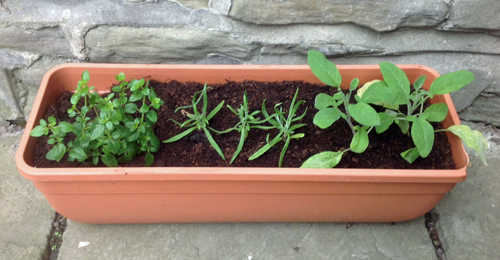 A few have rooted and were ready for potting up as you can see below – oregano, lavender and sage. They’re hardening off before they’ll be slotted back into the garden. The lavender hedge alongside the currant and gooseberry bed is coming into bloom. I harvest the buds to dry – both for cooking and scenting. This year, I’m also attempting lavender essential oil by steeping the buds in alcohol. This is not a true essential oil which requires a distillation process. My “essential oil” is an infusion or extract that is a bit less concentrated. Collect the lavender flower tops while still in the bud stage. Slightly bruise the buds and the attached stalks in a mortar, but do not grind. You want to begin the process of releasing the essential oils in the plant. 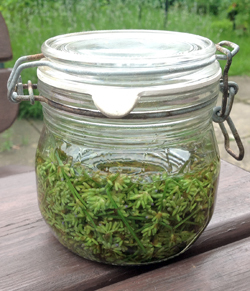 Pack the crushed buds and stalks into a sealable jar, top up with a high proof, inexpensive Vodka. Seal the jar. Within hours you will notice the alcohol taking on colour. Let it steep for about a week, shaking it occasionally to help release the oils. Decant by straining the liquid through a coffee filter and discarding the lavender pieces. Fill in the spaces underplanting the fruit trees – one suggestion was to plant borage, a self seeding annual with blue flowers that attracts those pollenating bees. Trim the grape vine and harvest the leaves and tender shoots. Continue the battle with slugs and snails. Decant and use the lavender essential oil as an air freshener. Around My Edible Garden is my monthly diary entry detailing what is happening in my garden this past month, part of the Garden Share Collective (GSC), maintained by Lizzie@strayedtable. A chronological listing of my garden blog posts is listed Diaries in the Menu bar. Thanks for the new word – an easy one to remember too. Also the timely recipe for lavender. 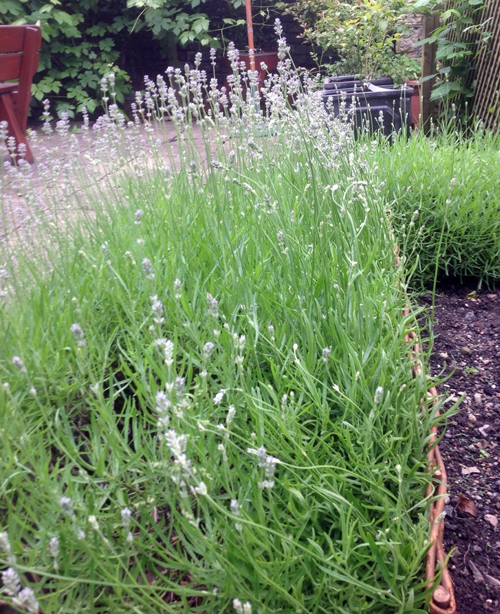 My lavender garden is in its second year, doing well and I was thinking of making different infusions. Sounds as if I should do them all soon before the full flowers form. Cool word, runcation. Perhaps if we start using it again (properly!) it won’t be obsolete. You are going to have fun with your lavender! It is wonderful mixed with sugar, infusing salt. Somewhere I read that it is also a good substitute for thyme. Also, an integral ingredient in herb de Provence. Lots of culinary uses for it, but this “essential oil” infusion I made is to be used in my air freshener diffusers. I think that most of the time, the buds are used rather than the flowers – something to investigate. Only two this year, but last year I had so many! We had to cut it back drastically and re-pot once we discovered that the roots had escaped the old wooden half barrel it had been in and were making their way down to the drain. 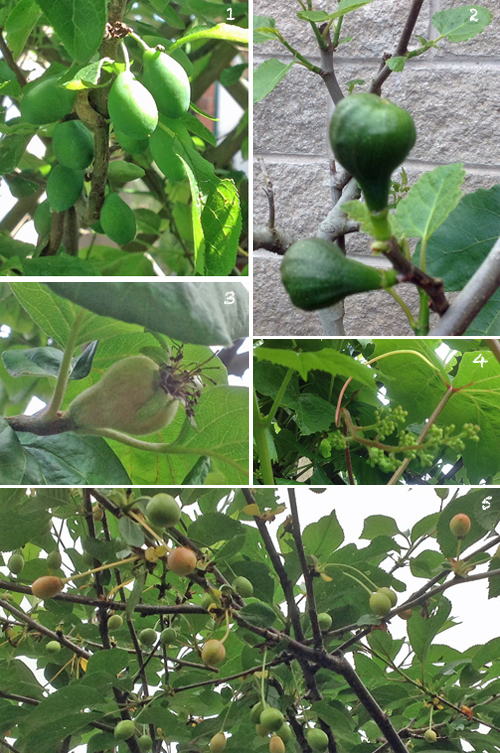 Naturally doing what figs do – seeking water. It will probably take a few years to recover. I’m just glad it is still alive! I do rather love this look around your lovely garden Debi! I can practically smell the lavender from here. I’ve mentioned before how much I like the copper trimmed cloches – they are such a brilliant idea. RUNcation – really? People go on holiday to run? I suppose that one gets to see the sights in a slightly more energetic way than I would choose! The cloches came from an on-line garden centre shop called Crocus, which you could google. Naturally RUNcation is American where, it seems, anything goes. Leave it to my fellow countrymen to garble a perfectly good word! The lavender is lovely. I particularly like this variety as it is a dwarf one and ideal for hedges. I’m so glad I decided on this rather than the box hedge, although box is nice, too – just not as nice smelling! I love lavender for scenting, but also as a culinary herb. I’ve only just tried this infusion method which seemed to work, but used a lot of lavender buds. I suspect your little pillows would be much more decorative and practical for scenting drawers and closets. The slugs have been rampant here and ate nearly all my runner beans overnight. Everything looks good in your garden – we’ve just picked our first raspberries and (fingers crossed) it looks as though it may be a good year for plums. 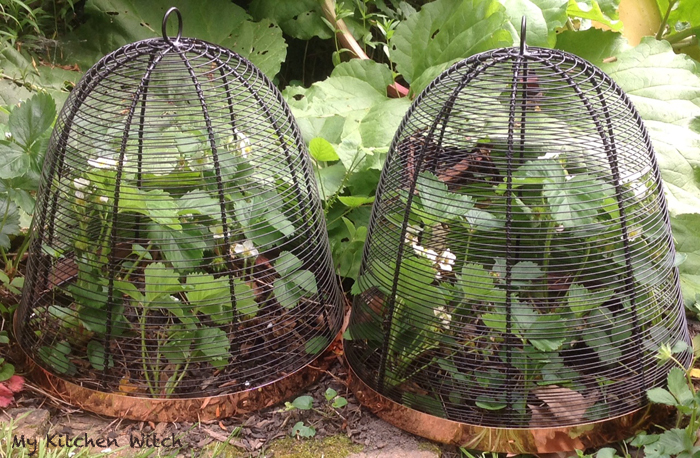 Off to look up those cloches – what a practical and decorative way to protect strawberries. What horrid creatures slugs are! I hope they saved some of those runner beans for you. The first raspberries, loganberries and black currants are now being harvested here. Both the red currants and the red gooseberries are beginning to turn colour. Can’t wait! Yes, my damsons look plentiful this year, but the cherries and quince are not as good as last year. The cloches are great, but a bit pricey. They are simply coated wire wrapped around a frame. I also suspect I will need to maintain them by spray painting with rustproof paint at some point. I wonder if they could be home made somehow? That would be a more practical solution if you need a large number. 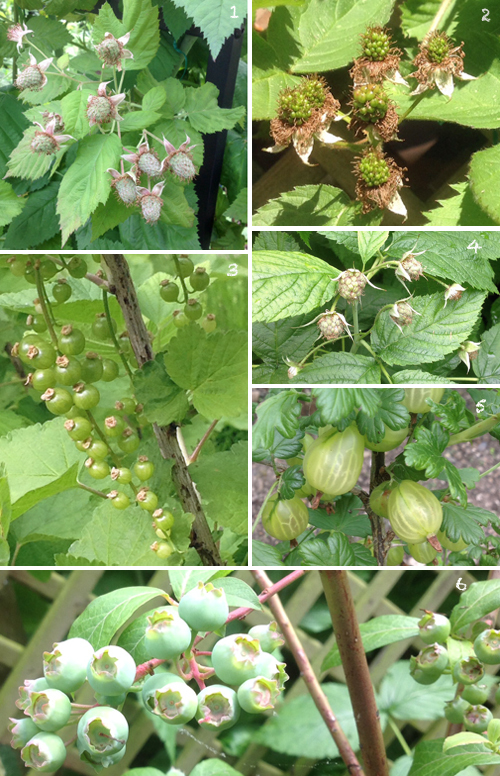 I really don’t know what I would do without a garden as I derive such a great pleasure wandering around, picking a few berries (including those black currants! ), snipping off a herb or two. Saying that, I have cut back quite a bit over the years and have tried to make most things less labour intensive. I could do without the runcation – and to be honest, I often just let those weeds go unless they begin to threaten plants or start to take over. It’s the lazy gene! Looking after 11/2 acres finished me off, vegies, fruit trees, hens, three teens and a fulltime job totally changed my priorities..
Lucky you! My husband mows what little lawn we have left and feels his job in the garden is done. I never heard of cuckoo spit before, either, but that is apparently what the Brits call the frothy stuff surrounding the nymphs of the insect called a froghopper. Other names for it are frog spit, snake spit or simple spittlebugs. Aren’t the Brits clever with language? I’m with you regarding holidays! Run, run far away! Your garden is AMAZING.Quite jealous of the figs in particular. And I had to laugh about a word like runcation being obsolete and being mistaken for a running vacation! The latter sounds like a brilliant oxymoron. It has taken years to get this rather small back garden into shape and I am quite proud of it. It is also fairly easy to keep. The figs number only two this year as the plant was trimmed drastically and repotted last autumn. However…I did get dozens of lovely ripe “Brown Turkey” figs, many of which became a luscious and lemony fig jam. Hopefully the tree will recover and start producing lots more next year. I guess I should go check my garden. It’s not in my backyard as it’s a community garden. I may even have some lettuce to eat! I did finally ‘win’ the battle against the noxious weed purple bellflower…for the time being. So I have allowed myself to finally plant some perennials and annuals. I’ve always wanted to have a lovely ornamental cabbage, so I planted two. Then yesterday I looked out to see my dachshund in the flower bed just as happy as could be munching the cabbage down to the nub! Do YOU have a pest the size of a dachshund?! we have those spit bugs too….not sure what they are called here. Naughty dachshund! I guess he (she?) likes the same kind of plants as you do. The real pests here are slugs and if I ever encountered one the size of a dachshund, I’m leaving the country! Hope your community garden – what I guess we would call an allotment – fares better. We used to have slugs in Aus. then again I never quite figured out the growing seasons there. We DID have a nightly slug migration from the rock wall on one side of the drive, across the drive and to our front lawn. It really amused the kids and my youngest would go out and move the slugs so hubby wouldn’t run over them when he came from work. We just don’t seem to get too many of them here in Calgary, thank goodness! We didn’t get many in Wisconsin, either. I think the cold winters and hot dry summers kill them off. If we have a mild winter here, I’ve noticed that they are particularly active the next summer (which is more than likely to be damp). They love rock walls – which we are surrounded by! Love those wire baskets on your strawberries ! They’re great and quite chic! I wanted something stylish since they’re positioned just outside my kitchen window and in constant view. Love the word. I will never think of it as plain old boring weeding again. I find runcation quite therapeutic (oh looky there, WordPress dictionary does not like ‘runcation’, it gave it a red squiggly). Amazing what on-line dictionaries do and do not have. I guess WordPress didn’t think to enter obsolete words! Glad someone likes runcation (the activity, that is). It’s hard on the knees! I am going to have to make some of your lavender oil before I kill my plants, they nilly look ready to die. I too have had something eating my rhubarb leaves, I never thought anything could eat them. It is amazing that pests can eat those rhubarb leaves which are quite toxic to humans. But, slugs tend to eat anything and get everywhere! They even clime walls.